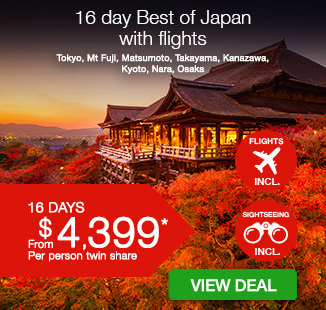 16 day Best of Japan tour including return international flights, accommodation, breakfast daily, professional tour guides, in-depth sightseeing and more. Experience this 16 day Best of Japan tour, which includes your return international flights, accommodation, breakfast daily, professional tour guides, in-depth sightseeing and more. Your adventure starts in the bustling capital of Tokyo, where you will visit popular temples and shrines before snapping up a bargain on the popular Nakamise Shopping strip. Be awe-struck by Mount Fuji, cruise Lake Ashi and be mesmerised by the natural beauty of the Hakone region. Travel inland to the cultural city of Matsumoto before making your way to Takayama; spending time in the Hida Folk Village. Head to the remote town of Kanazawa and enjoy a colourful city tour. Make the most of your time in Kyoto, visiting a myriad of their infamous temples, shrines, palaces or gardens. Wander through Nara Park and mingle with the hundreds of deer roaming freely. Your tour will finish in Osaka, visiting one of Japan’s oldest Shitenno-ji Temple. Make the most of some last minute shopping and local Japanese cuisine before you spend your last night in this breath-taking country. You’ll love every minute of this incredible tour! See the full list of Inclusions here. Today depart New Zealand for to Tokyo! Japan’s bustling capital, mixes the ultramodern and the traditional, from neon lit skyscrapers and anime shops to cherry trees and temples. Upon arrival, you will be met and transferred to your Tokyo city hotel for check-in. Today after breakfast, we make our way to the Meiji Shrine. Later, stroll through the Asakusa Kannon Temple one of Tokyo’s most colourful and popular temples before browsing for souvenirs at Nakamise Shopping Street and Odaiba area. This afternoon, relax on a Water bus toward Hama-Rikyu garden. Your last stop today Tokyo Tower before heading to your hotel. Today is a free day to explore one of the world’s greatest cities. Tokyo offers a seemingly unlimited choice of shopping, entertainment, culture and dining to its visitors or buy an optional tour to Disneyland. Today, visit Oshino Hakkai. Known as the Springs of Mount Fuji, the eight ponds are fed by melting snow filtering down from the slopes of nearby Mount Fuji through porous layers of lava resulting in very clear spring water that is revered by the locals. Lunch is served at the local restaurant. Later, take a cruise on Lake Ashi, and savour the numerous delights of nature in the Hakone region. Hakone is part of the Fuji-Hakone-Izu National Park, less than 100 kilometers from Tokyo. Famous for hot springs, natural beauty and the view of nearby Mt. Fuji. Enjoy another free day of leisure to explore Tokyo at your own pace. Today we leave Tokyo behind us and travel inland to the cultural city of Matsumoto, famed for its castle. You will have time to stroll through the former merchant district of Nakamachi, lined with well-preserved old buildings where you can find lovely local crafts, treasures and great restaurants. We then make a visit to Matsumoto Castle, considered in the top 3 feudal castles of Japan and arguably the city’s most famous site. This morning after breakfast, we leave Matsumoto and make our way to Takayama. Today we visit some of Takayama’s highlights. We begin our day with the Hida Folk Village, an open air museum exhibiting over 30 traditional houses from the region. After, we continue to the Matsuri-no-mori museum, which showcases the key aspects of the Takayama Festival, which takes place for two days each spring and autumn. An early start this morning to visit the Takayama markets where local fresh produce and souvenirs stalls are on display. We then continue on through the narrow streets of Takayama’s Sanmachi Suji historic district which are lined with wooden merchants’ houses dating to the Edo Period, along with many small museums. We will stop at Shirakawago Village before arriving in Kanazawa. After breakfast, we enjoy a city tour of this colorful city. We begin with a visit to the Nagamachi Buke Yashiki district with the highlight of Nomura-ke. Nagamachi was a samurai district located at the foot of the former Kanazawa Castle, where samurai and their families used to reside. We then continue to the Kenroku-en Garden – from its scale and beauty, it is regarded as one of the most beautiful feudal lords’ gardens in Japan and has been maintained over generations. In the afternoon, explore the Higashi Chayagai district famous for its teahouses built in traditional Japanese design. We finish our day with a visit to the Omicho Market, Kanazawa’s largest fresh food market since the Edo Period. Today is a free day to explore Kyoto at your own pace. Kyoto attracts millions of visitors every year and it’s no wonder. With over 1,600 Buddhist temples, 400 Shinto shrines, palaces and gardens, who would not want to visit? You might be lucky enough to spot a Geisha in the old district. This morning we travel to Nara and visit Kiyomizu Temple and drink to your fortune from the streams of the Otowa Waterfall and we visit the Nishijin Textile Centre and enjoy a traditional kimono show. We then visit Fushimi Inari Shrine before we wander back through Nara Park, home to hundreds of freely roaming deer. Considered in Shinto to be messengers of the gods, Nara’s nearly 1200 deer have become a symbol of the city. We will leave after visiting Todaiji Temple, one of Japan’s most famous temples. The massive building houses one of Japan’s largest bronze statues of Buddha (Daibutsu). This morning after breakfast, we get to know this neon powerhouse starting with a visit to Osaka Castle. We then make our way to the Shitenno-ji Temple, one of Japan’s oldest temples and the first ever to be built by the state. We continue on to the Umeda Floating Garden Observatory for 360 degree views of Osaka. Finally we head to the Shinsaibashi Shopping District which is the city’s most famous entertainment district and offers abundant dining and shopping choices. $1095 per person in addition to the twin share voucher.